Let’s face it: Ads are an interruption. In fact, they always have been. Advertising executives have tried their best to hide that fact by making advertisements funny, amusing, and occasionally even downright controversial. However, the audience has caught on too. In display ads, this is proven by the existence of banner blindness. Native ad networks may be the solution to this. The basic philosophy of native advertising revolves around making ads appear less like ads. For instance, while browsing through the food section of BuzzFeed, you may come across a story titled “The Evolution of Pizza”, which has been sponsored by Pizza Hut. Here are six content recommendation and native ad networks that will help you supplement your display ad revenue and drive higher engagement on your website. 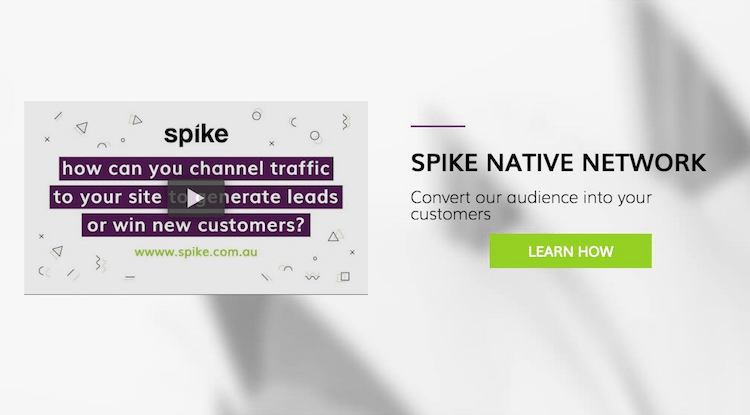 Spike is a native ad network with a difference. Focused on premium business audiences, Spike has established a network of premium website partners in Australia with an audience of business owners and other high-net-worth individuals. Publishers who join the Spike network can ‘plug and play’ Spike ad units, immediately monetising their existing audience. With the revenue between the publisher and Spike Native Network split 50%, Spike believes in fairly rewarding publishers for their audience. With the premium positioning of Spike, publishers existing content isn’t cheapened by having low quality click bait style headlines alongside their own content. With higher quality advertisers on the network, higher CPC and CTR are enjoyed by Spike publisher partners. Payments are made to publishers monthly, determined by the number of clicks generated through their websites. Real-time reporting is available at all times to publishers through the simple to use publisher admin interface. 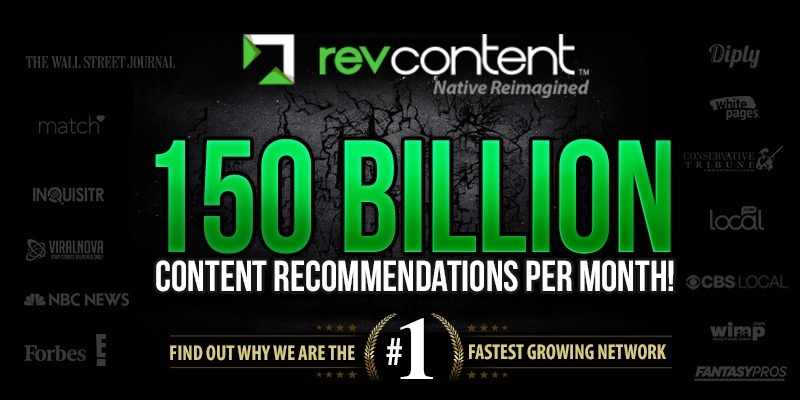 Revcontent is the fastest growing content recommendation / native ad network, and even starting 5 years after Outbrain and Taboola, they are quickly catching up and even surpassing. According to comScore, their network reaches more users than Amazon and YouTube. A few of their exclusive partnerships are names like Newsweek, International Business Times, The Christian Post, Diply, Heavy.com, and more. With their recent acquisition of the largest European content recommendation network, Revcontent is quickly scaling globally. Their network generates higher revenue and higher engagement rates for their partners by focusing on selectivity; they deny 98% of the sites that apply. They are also widely recognized for their targeting capabilities. They offer more control and transparency in their platform than any other network. Advertisers have the ability to target based on geo-location, mobile operating system device, brand, and they recently launched the only retargeting pixel available in content recommendation. Lots of our users split test between us, Taboola, and Outbrain and sign on with us. A lot of our business comes from advertisers and publishers who used other discovery content platforms for years but grew tired of not making any money or not having a rep in the company, so they sign on with us. AdNow is a native ad network that’s been in the business since 2014. It currently has over 190k partners and serves well over 4 billion impressions to over 900 million users worldwide, monthly. The network generates revenue by showing targeted content recommendations on your website or mobile app – picked from their sponsored content marketplace providers. Keep in mind, sites/apps with a predominantly female audience are best positioned to make the most ad revenue from AdNow. The registration and setup barely take 5 minutes. You get a widget code that is compatible with other ad systems on your site/app. And you start out with $20 payouts, received weekly via Paypal or Wire. As with Taboola, AdNow lets you promote your content through their self-serve platform for up to 50% boost in page views. Unlike Taboola, the ads are pre-moderated (read: safe). If you need it, you can get a personal manager who speaks your language for help. Editor’s Tip: If your site/app niche falls under the AdNow profile categories like health, beauty, lifestyle, et al — place the AdNow widget at the bottom of the articles to raise your CTR to 2% or higher. You can check their official thread on DigitalPoint forum here for more information. One of the first native ad networks to enter the market, Outbrain started marketing its services in 2006. 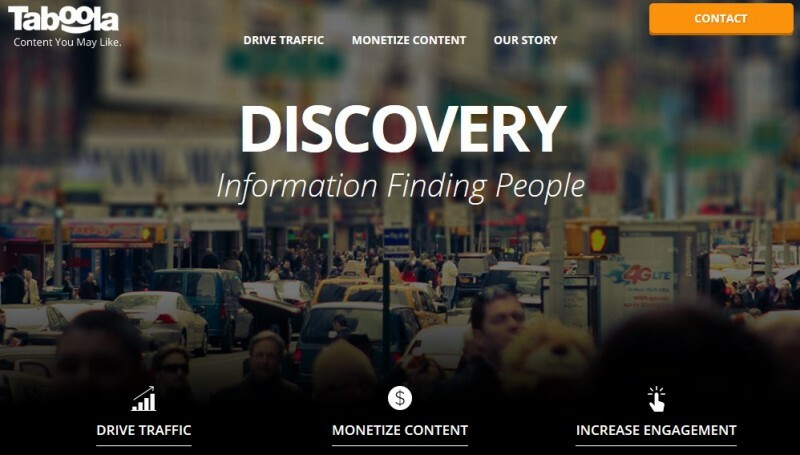 It’s essentially a content discovery platform that helps businesses and brands reach a wider audience and increase their web traffic by distributing their content across big media companies such as Hearst, Slate, Ney York Post, The Daily Telegraph, CNN, ESPN, Fortune, Atlantic Media, Time and more – in addition to a larger network of small publishers. Publishers get paid proportionate to the traffic that they’re able to divert to the advertiser website. 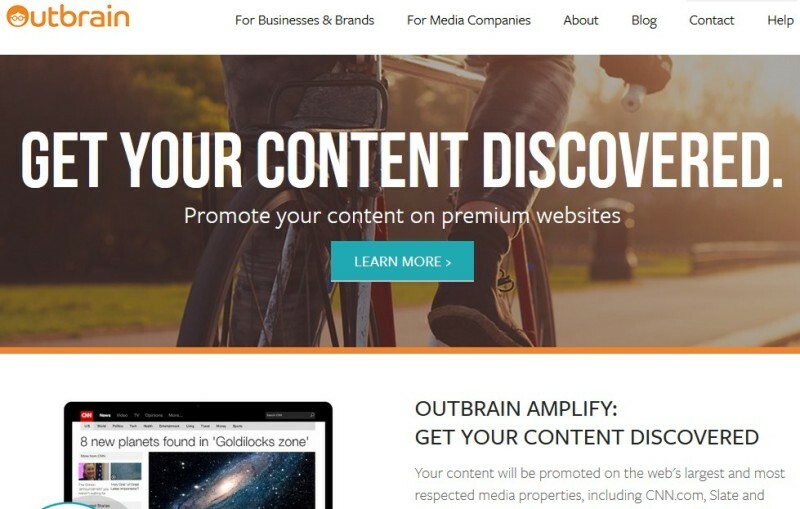 Outbrain employs behavioural targeting to increase user engagement and provides recommendations for several media types, including online, video, and mobile. It claims to be installed on more than 35,000 websites, serving over 150 billion recommendations and 15 billion page views per month – reaching over 87% of U.S. Internet users. A direct competitor of Outbrain, Taboola is a content marketing platform and one of the most popular native ad networks that provides a “content you may like” widget to online publishers to display promoted content including articles, videos, and slideshows. BBC, USA Today, Mail Online, TMZ, Business Insider, NBC News, Chicago Tribune, and Boston Globe are among the many publishers that form the Taboola network. While Taboola and Outbrain are more or less the same in terms of functionality, they do have some differences that help differentiate themselves from each other. 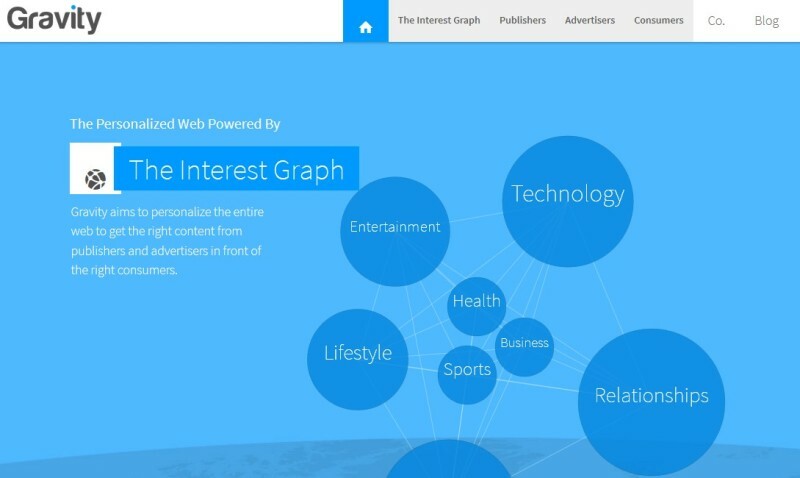 The quality of recommended content found on Outbrain is usually higher because they pre-filter content that they consider to be spam, Taboola takes pride in its Taboola Choice feature where users can offer feedback on what recommendations they don’t like, so that the platform is constantly learning and improving from user feedback. As far as mission statements go, Gravity has given itself a big one – they aim to personalize the entire web, in an effort to understand user interest patterns and serve personalized content recommendations based on the topics that they engage with most. They do this by analyzing each web page, tweet, and status update that’s published on the web in real time and organizing it all by interest to identify trending topics and the most relevant stories about any topic. For publishers, Gravity provides a set of personalized plugins that allows personalized content recommendations and sponsored content to be displayed on the website. Brands, advertisers, and even content producers can access the publisher networks to promote sponsored stories to increase their reach and visibility. Many leading brands such as Charles Schwab, Sony, Intel, Toshiba, Gap, AOL, WordPress, Pando Daily, The Hollywood Reporter, and TechCrunch use Gravity’s native ad network to meet their brand and readership goals. Content recommendation systems are great and serve as a smart way for publishers to supplement revenues generated by traditional display advertising networks such as AdSense, but thankfully the native advertising ecosystem is much more diverse. 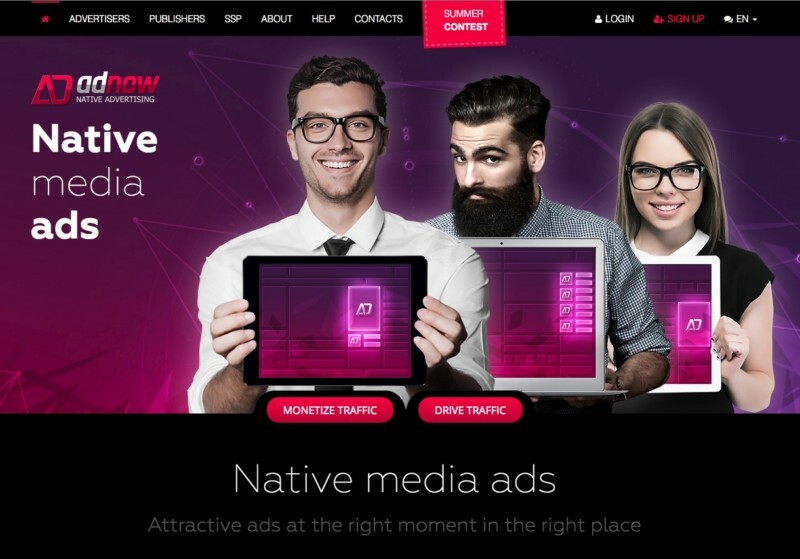 Nativo is an outlier among native ad networks in that it allows publishers and advertisers to scale, automate, and measure native ads. 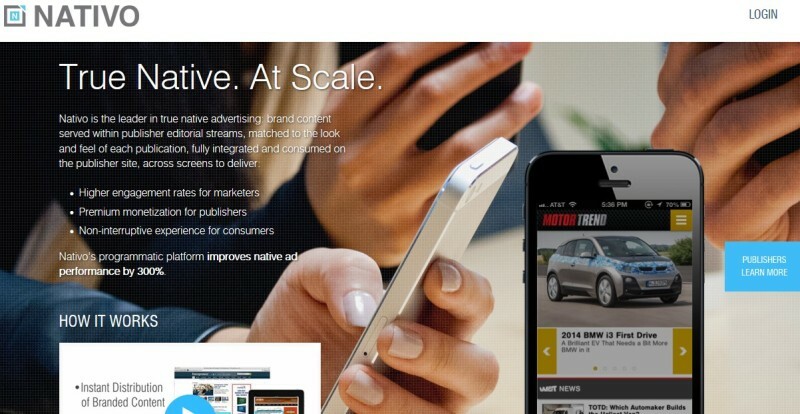 Currently, more than 300 brands and 350 publishers use Nativo’s platform to power their next-generation digital advertising. The distinctive feature of Nativo, one that separates it from the usual content recommendation systems, is that Nativo serves the advertiser’s content in-feed, i.e. the user can view the sponsored content without ever leaving the publishers website. The content is served as part of the publisher’s content updates with a tag that clearly states “sponsored” – it’s a much more seamless way for advertisers to promote their content and publishers gain because the users never leave their website. Just last month, Nativo raised $20 million in funding, pretty much reinstating that native is here to stay, and so are they. Turns out that Nativo isn’t the only ad tech company trying to bring blur the lines between native and programmatic advertising – TripleLift is another strong player. TripleLift currently has 400+ advertisers and 2300+ publishers. This includes advertisers like Microsoft, Nissan, GAP, jetBlue, Kraft, Land Rover, Campbell’s, AT&T and publishers like Men’s Fitness, Conde Nast, Digg, USA Today, Atlantic Media, eHow, Hearst, and more. The mode of operation is similar to Nativo. Advertisers can create content-based campaigns and then deploy them across multiple publishers’ websites at one go. At the publisher website, the content is automatically displayed in-feed and mimics the exact design specifications of their regular content with just a tag that states “sponsored” attached next to it. TripleLift’s platform allowing true RTB auctions, enabling buyers and sellers to leverage unique data, bidding algorithms and real-time insights to their advantage. It also uses computer vision technology to recognize elements such as faces, objects, and text areas in an image to republish them in the best possible manner. Looking for a better way to manage your ads.txt files? Try our free ads.txt manager tool, designed to enable visual management of ads.txt files from a simple admin panel with features like file import, multi-site support, and auto validation. What are Auto-refresh Ads and How do They Work? 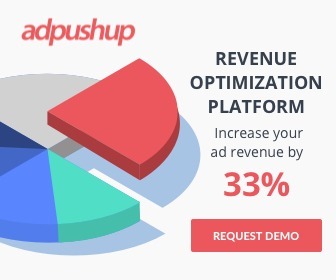 AdPushup provides tools to help web publishers optimize their ad revenue. On this blog, we cover tools, guides, and advice from industry experts to help web publishers achieve their growth objectives.